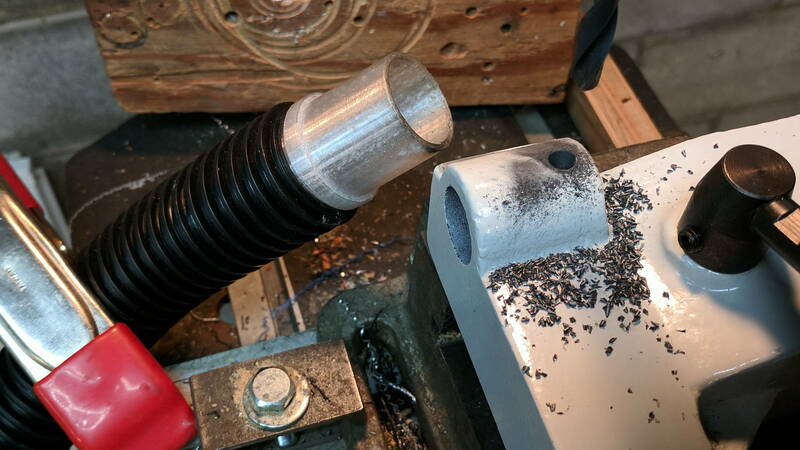 Filling the mini-lathe’s tailstock ways with epoxy made it slide easily and lock firmly. 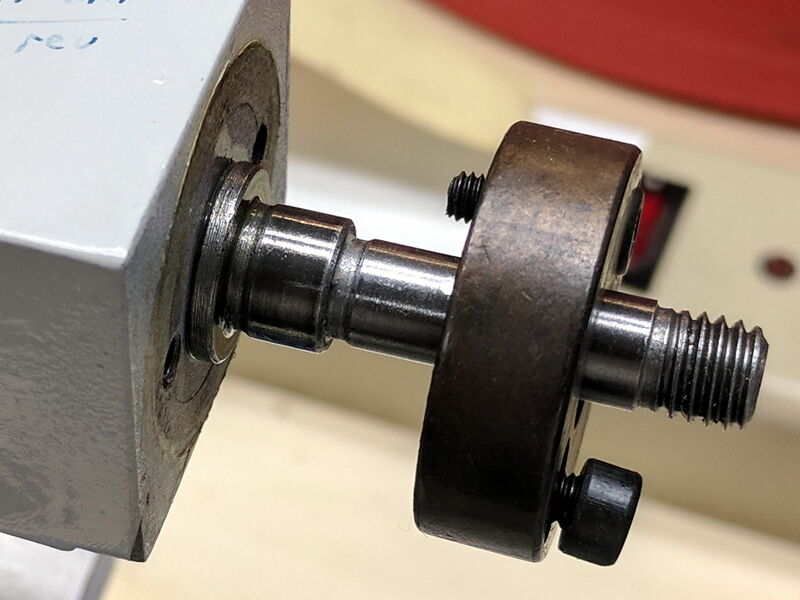 Some upcoming projects urged me to perform The Canonical Mini-Lathe Tailstock Upgrades, as shown nearly everywhere on the Intertubes and detailed in various HSM articles. 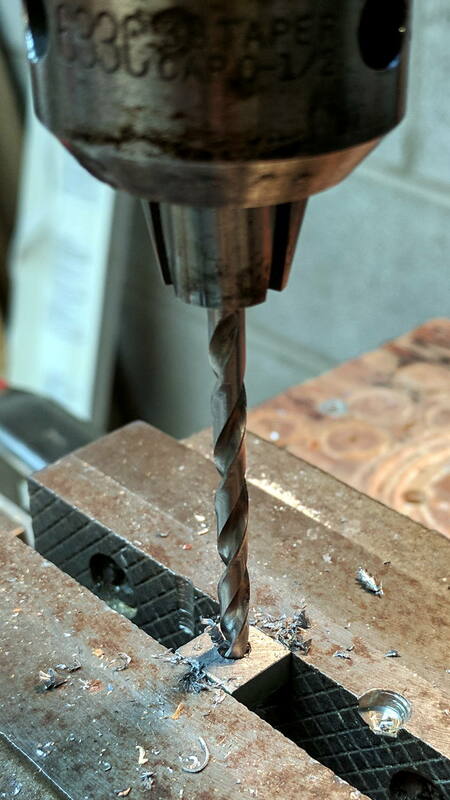 The drill went through the tailstock so easily I think the hole had been capped with body filler, which would eliminate the need for a bottoming tap. 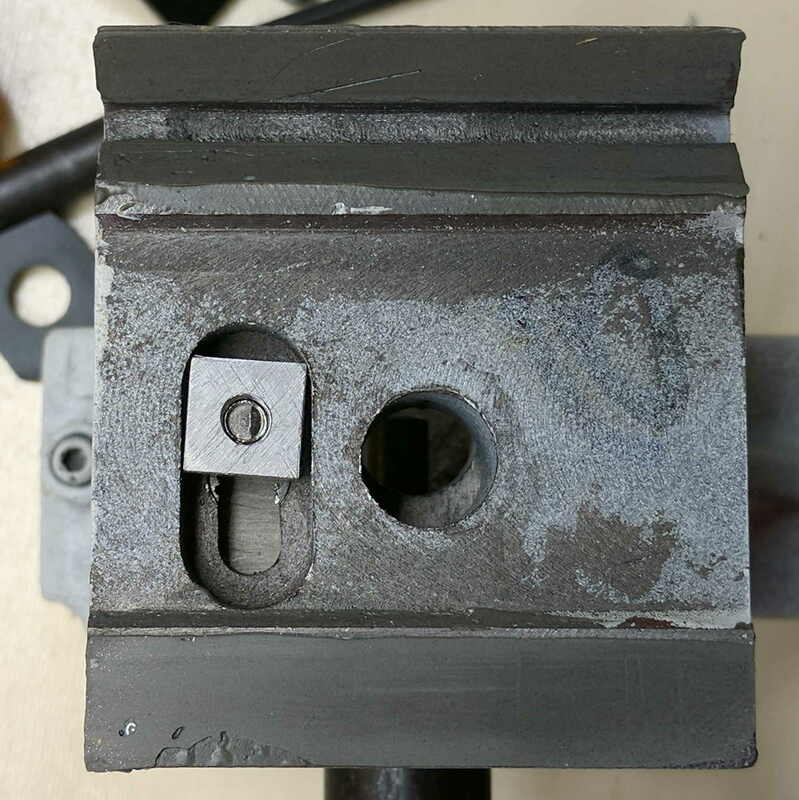 If the tailstock ever needs more adjustment range, I can knock those corners down a bit. 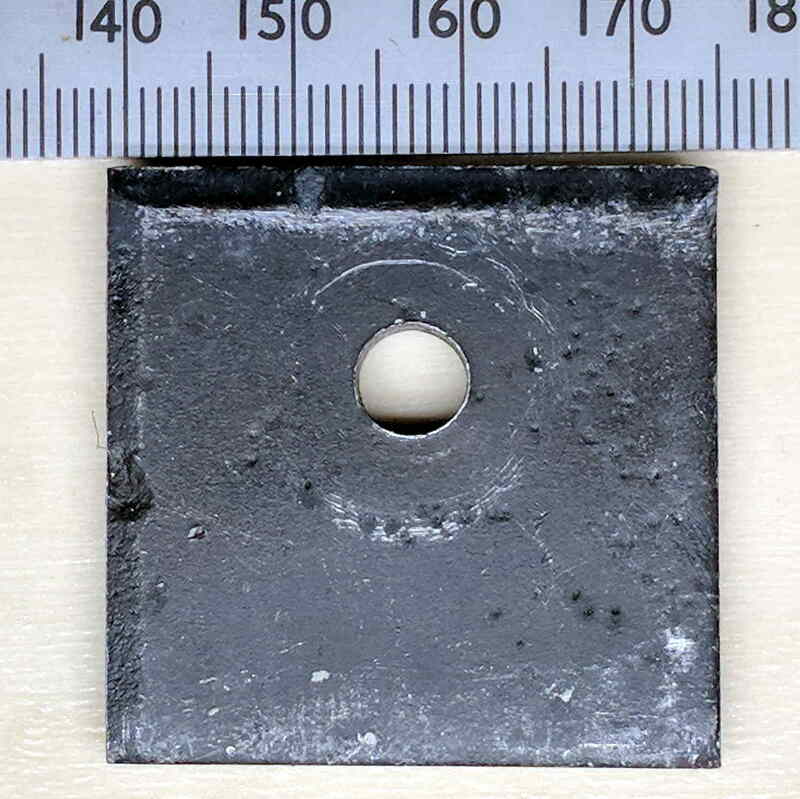 The little tip comes from using a square-ended cutoff tool. 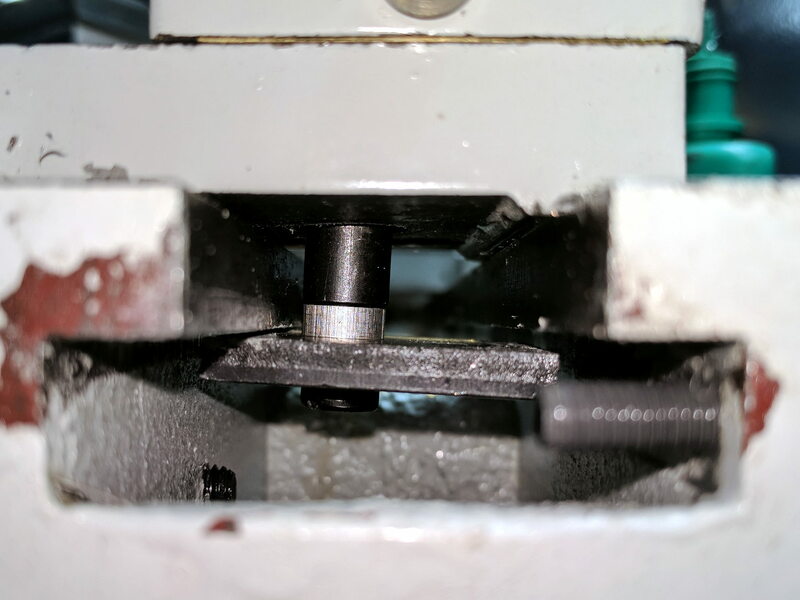 Purists will dress the tool at a slight angle to cut off one side first. Of course, which way one dresses it depends on whether you want the remaining stub on the stock or the cut-off part. 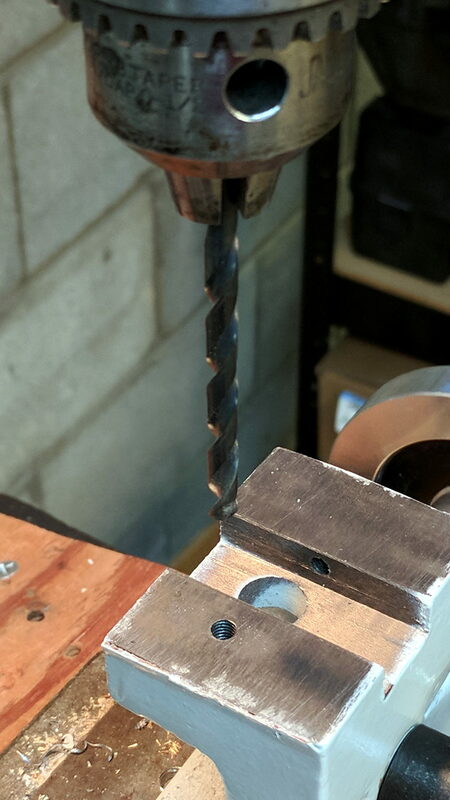 Sooo, I still have a square tool. 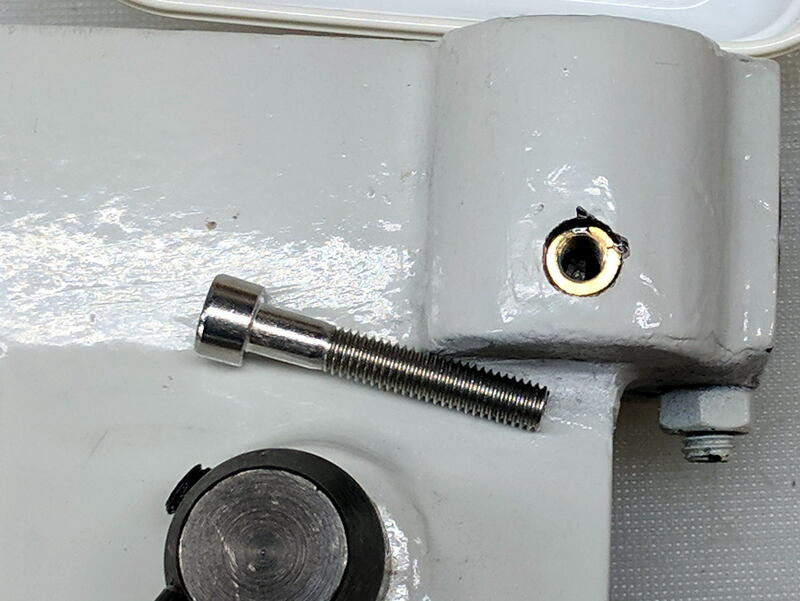 The plate hangs lower toward the rear because the clamping bolt isn’t in the middle. 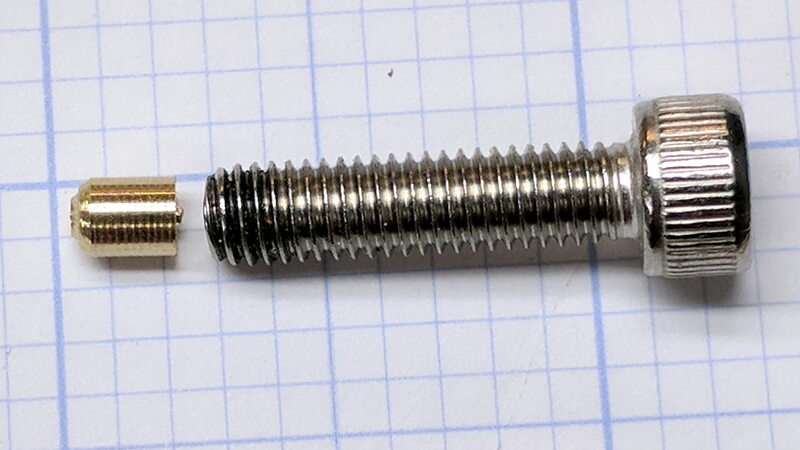 The tailstock originally had a mighty spring holding it level, but the spring tended to snag against the front side of the bed, so I removed it. The vacuum hose slurped up the cast iron dust, which is a Very Good Idea. 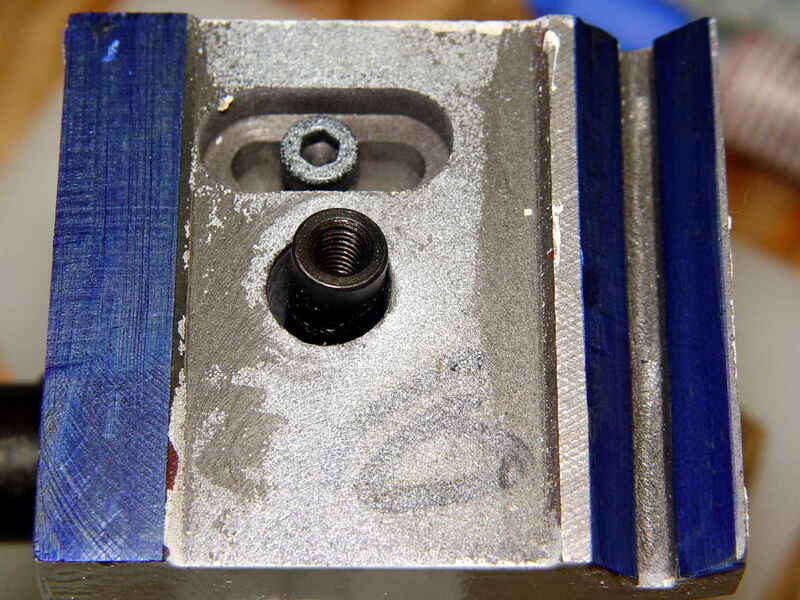 The finger-tight nut serves to lock the SHCS in place against the lever’s impact. I conjured a small bumper around the head from a rubber foot intended to fit under a random box of electronics. 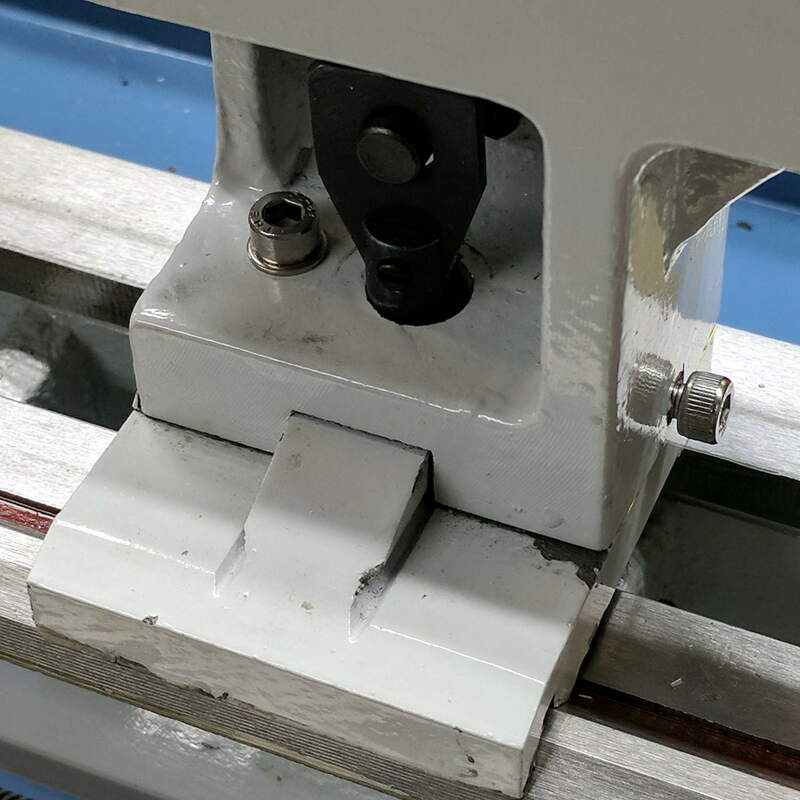 Pushing the lever leftward to the stop lets the tailstock slide freely and pushing it to the right clamps the tailstock to the bed. 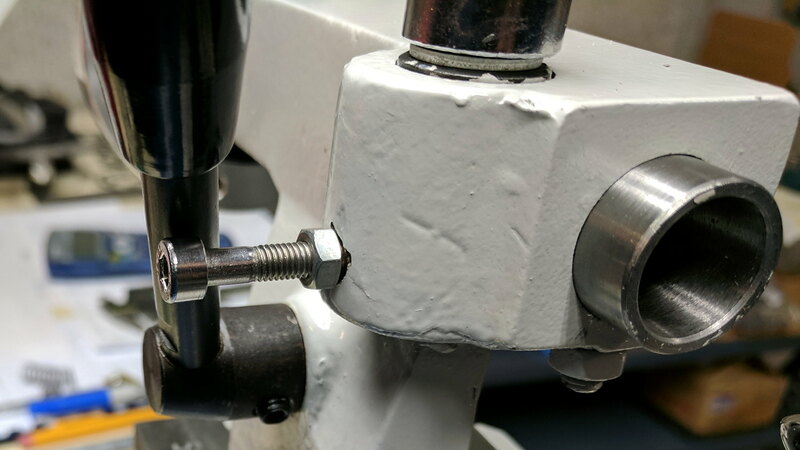 The cam’s limited rotation keeps the plate close enough to the underside of the bed to prevent it from tipping left-to-right as the tailstock slides, so it no longer snags. The flange over on the left bears against the steel disk on the right, with no real thrust bearing to be seen. A dab of grease improved its disposition. This entry was posted on 2017-10-16, 07:26 and is filed under Machine Shop. You can follow any responses to this entry through RSS 2.0. Both comments and pings are currently closed.